Hi! Welcome to A Baker’s House! I’m Holly Baker –thanks for wanting to learn more about me. This gem of a photo shows that my love for cookies started years ago! My sister and I are making a glorious mess (or maybe a masterpiece) in the kitchen I most remember of my childhood. My mom still has some of those kitchen tools that are out on the counter. Great memories are made in the kitchen! My name is Holly and I started this blog in 2011 as a way to share recipes with my mom across the miles (we live in Colorado and my extended family lives in Pennsylvania). Soon I realized that I had a few more viewers each day than my mom and her friends. How exciting! Also, I learned that I thoroughly enjoy the process of baking, photography, and writing blog posts. I’m grateful to be part of a wonderful blogging community, particularly food blogging, and I’ve been lucky to get to make personal connections through blogging. Is Holly Baker your real name? 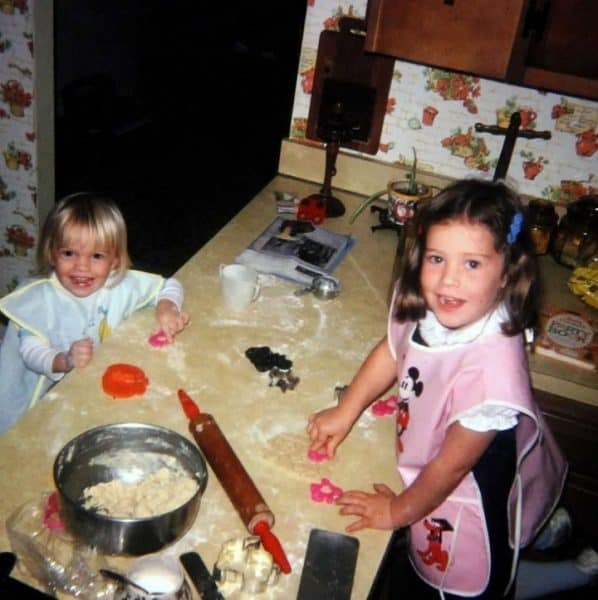 Yes, those were the days before Caller ID, cordless phones, cell phones….and the phrase “A Baker’s House” stood out for me when I started this blog as a perfect way to capture me: I’ll always be part of the Baker Family and I love to Bake. So welcome to this piece of my life, Holly Baker’s A Baker’s House. My purpose in writing this blog is to share desserts that make you happy. It’s that simple. If you eat traditional desserts you’ll find plenty of recipe ideas here. If you need to eat gluten free, you’ll find goodies here for you too. Cookies are my go-to sweet and I love trying my hand at decorating sugar cookies with royal icing. Do you know how easy it is to bring a smile to another person simply by offering them a cookie? I’d like to share that feeling with my readers of how simple acts of kindness such as baking for others with the recipes published here can make a positive difference in someone’s day. Is this a Gluten Free Blog? There are many gluten free recipes on this site, but for now, this blog is NOT a gluten free blog but I do eat gluten free myself. It hasn’t always been that way. In June 2017 my older son was diagnosed with celiac disease. He has a host of eating issues related to sensory issues and has never eaten any of the desserts I’ve made (more on that another time). I thought that I would likely have celiac, too, but it seems that I am gluten intolerant without having the specific diagnosis of celiac. 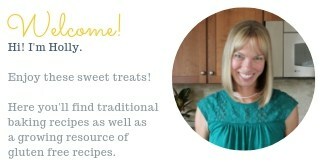 So even though I am now eating gluten free, I am still including recipes that contain gluten on my site. I bake often for others who do eat gluten; also, I think it is good to share my experience of baking both gluten and non-gluten in my kitchen to show how I keep the two worlds separate. There are many families working on the same balancing act– I am right there with you! You may find recipes from the early days of my blogging– I’ve kept some of the readers’ favorites like this white fish baked paiche dish even though they don’t fit under the baking and dessert category. There may even be some DIY and crafts still lingering on the site. They are all part of my evolution, some are better than others, but it’s fun to look back and also to be excited for the future. Who takes the photos for A Baker’s House? I’m learning more about photography each time I pick up my camera. I took a short, introductory course on digital photography a few years ago even before I owned a DSLR camera. I’ve gone to the School of Google for a lot of my photography knowledge but the best way to improve is to practice. In November 2017 I joined Food Blogger Pro and have already improved my photography and other aspects of my blog. I am excited to continue to learn and to work towards improving myself and my blog in small steps at a time. Here is more info on Blogging Resources that have helped me grow. Find more about my photography and equipment here on my Food Photography Resources Page. What are the most popular recipes and ideas on A Baker’s House? This quick video gives you a hint of what is popular here on A Baker’s House. A bit of everything– recipes, kitchen tricks, and baking tips! Subscribe to email updates to receive the latest posts and you’ll receive an instant download of all the recipes you see in the video below. What else is going on in the life of Holly? What am I doing when I’m not baking? Well, most of my days are centered around my two boys, ages 9 and 13. I practice yoga regularly and we play as much golf as a family as the weather and seasons allow here in Colorado, which is surprisingly the majority of the year. Random goals of mine in the near future? Learning to cut and install crown moulding, clearing out some of the clutter and getting organized at home, and refreshing my coding skills so that I don’t feel like those courses I took in college went to waste. Want to know more, just ask me!